The Amazon: A Severe drought in 2005 caused low river levels. 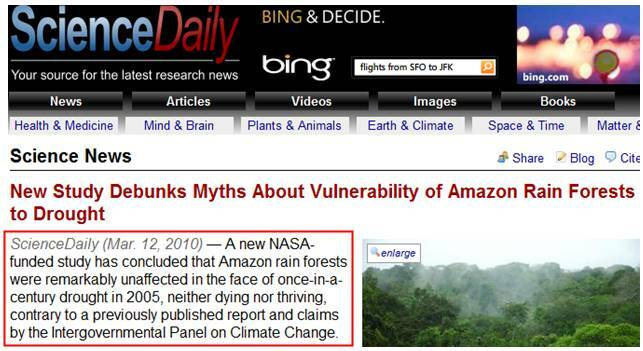 The most recent study indicates the Amazon is not nearly as vulnerable to drought as the alarmists claim. 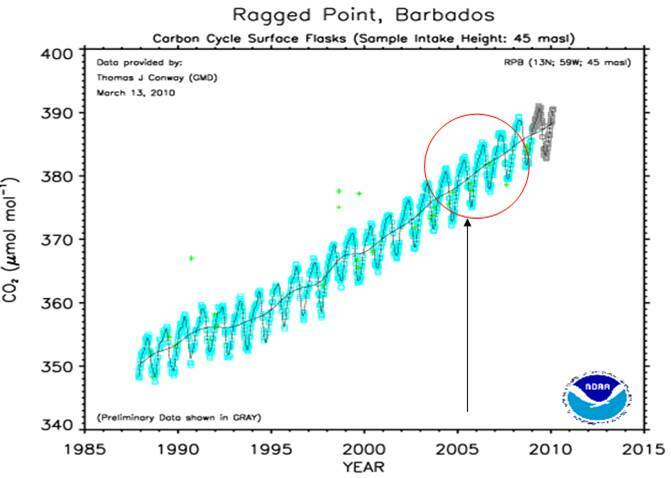 At the end of this document: a look at the effect on atmospheric CO2. · "We found no big differences in the greenness level of these forests between drought and non-drought years, which suggests that these forests may be more tolerant of droughts than we previously thought," said Arindam Samanta, the study's lead author from Boston University. 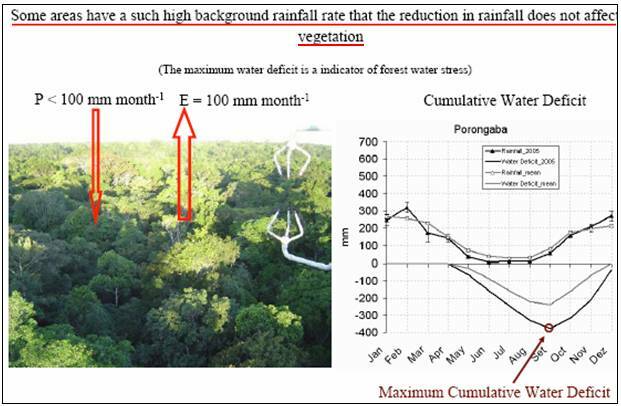 · The IPCC is under scrutiny for various data inaccuracies, including its claim -- based on a flawed World Wildlife Fund study -- that up to 40% of the Amazonian forests could react drastically and be replaced by savannas from even a slight reduction in rainfall. The following figures are from the above study. 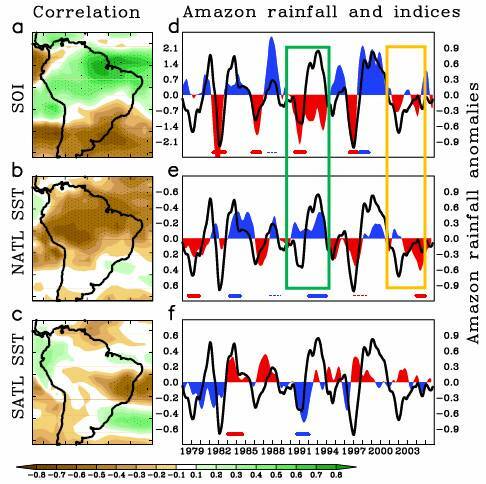 The above paper studied the correlation between the Amazon rainfall and the Southern Oscillation Index (SOI and North Atlantic sea surface temperatures (NATL SST). 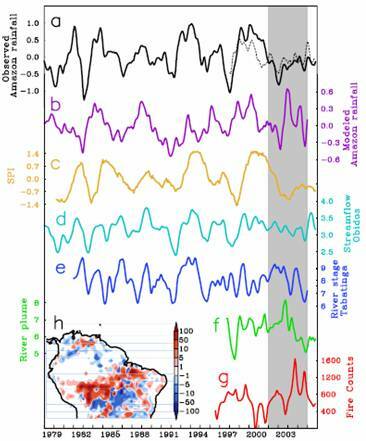 “The correlations with SOI and NATL are significant at 95% level over large area of the Amazon basin.” The following figure is from the study. In the late 1980s-early 1990s there was an extended El Nino period (negative SOI), but this was counteracted by lower N. Atlantic SST (green box in figure below). 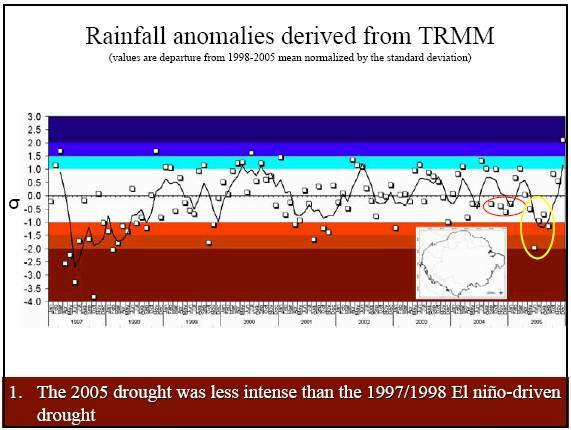 In the early 2000s the El Nino and N. Atlantic SST were in sync causing extended reduced rainfall (orange box in figure below). 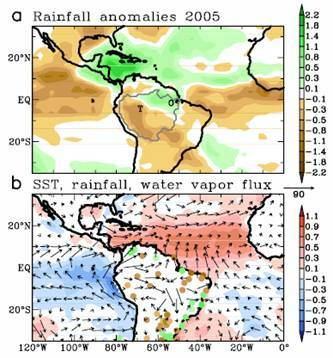 The following figure from the above Zeng et al study, shows the Amazon precipitation for the 10 datasets plus Obidos streamflow and Tabatinga river stage data. 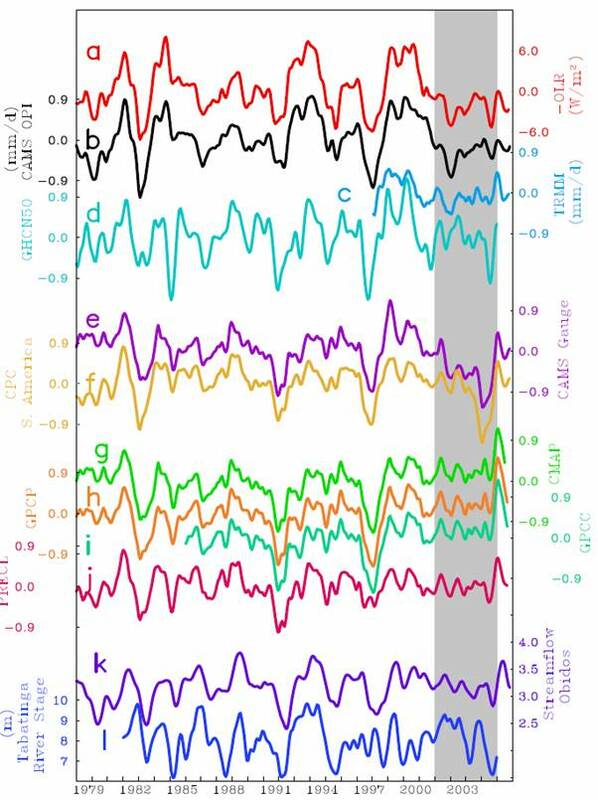 What was the impact of the extra 5 billion tons of CO2 (more than the annual emissions of Europe and Japan combined) on global atmospheric CO2? 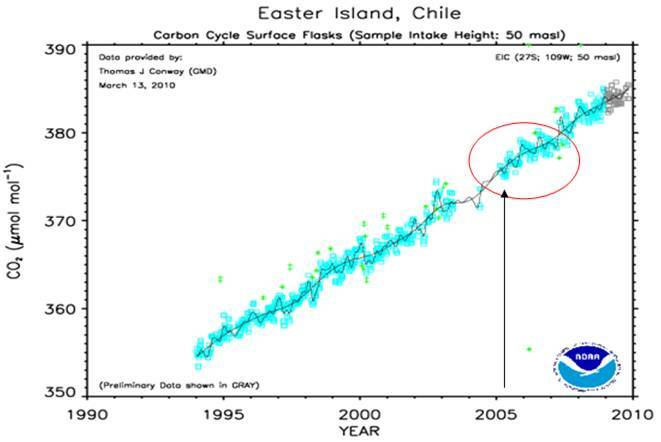 The following figures show CO2 at a couple of the NOAA measuring stations (graphs from http://www.esrl.noaa.gov/gmd/ccgg/iadv/) The only CO2 monitoring station in South America started in 2006. Thus the nearest stations (Easter Island, Chile and Ragged Point, Barbados are shown). No noticeable impact. Apparently Europe and Japan could cease all emissions and accomplish nothing.